The Ikeda Honyaki knives prove the level this blacksmith is performing on. Unlike the more popular and easier technique of combining different steel layers, the Honyaki approach works differently. 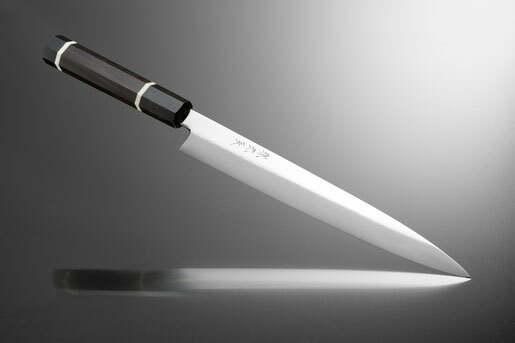 Honyaki knives are made out of only one steel which has to be finished very carefully. The way of finishing is crucial for the result. If done the right way, Honyaki knives are hard to beat. Core: Shirogami 2 steel, hardened to HRC63. Cladding: This Honyaki knife only consists of one steel which is fine-tuned on the surface. Finishing: High-end Honyaki finish by Ikeda. Quenched in Water. Handle: Fine Ebony handle, which is premium quality and very dirt-resistant and robust. Octagonal for perfect grip. Buffalo horn ferrule bolster.